This is a great way to spend a Saturday morning! Enjoy live music, occasional street dances, special events booths and more, plus shop for the best locally produced vegetables, fruits, dairy products, meats and more. The Saturday Corvallis Farmers Market has a changing lineup of 50 to 70 vendors per week, and the Wednesday market usually offers 20 to 30 vendors. 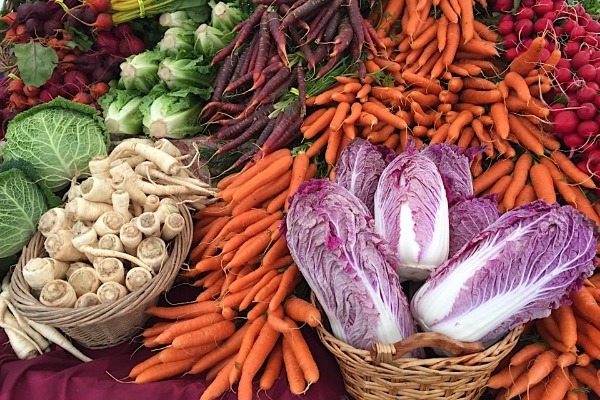 Early market weeks feature spring raab and many other greens, potatoes and other storage vegetables, radishes, fresh turnips, carrots, rhubarb, preserved foods, honey, eggs, meat, poultry, and cheese, plus nursery plants and cut flowers. On the other extreme, the last market in November will feature much of what will be on Thanksgiving tables.